When concert promoter Carol Bruno and nightclub owner Gil Miracle announced on Monday that a planned concert by dancehall reggae artist Buju Banton was canceled, it wasn't the first time a reggae show got the axe because of an artist's gay-bashing lyrics -- and if you look at reggae history, you know it won't be the last. Back in 1992, Shabba Ranks, a rising star in Jamaican dancehall, was on the verge of crossover success in America and England when he found himself embroiled in controversy. Appearing as a guest on a BBC-TV music show, Shabba was asked about the incendiary dancehall hit du jour, "Boom Bye Bye," by a young Jamaican artist called Buju Banton whose patois lyrics basically advocated killing homosexuals. 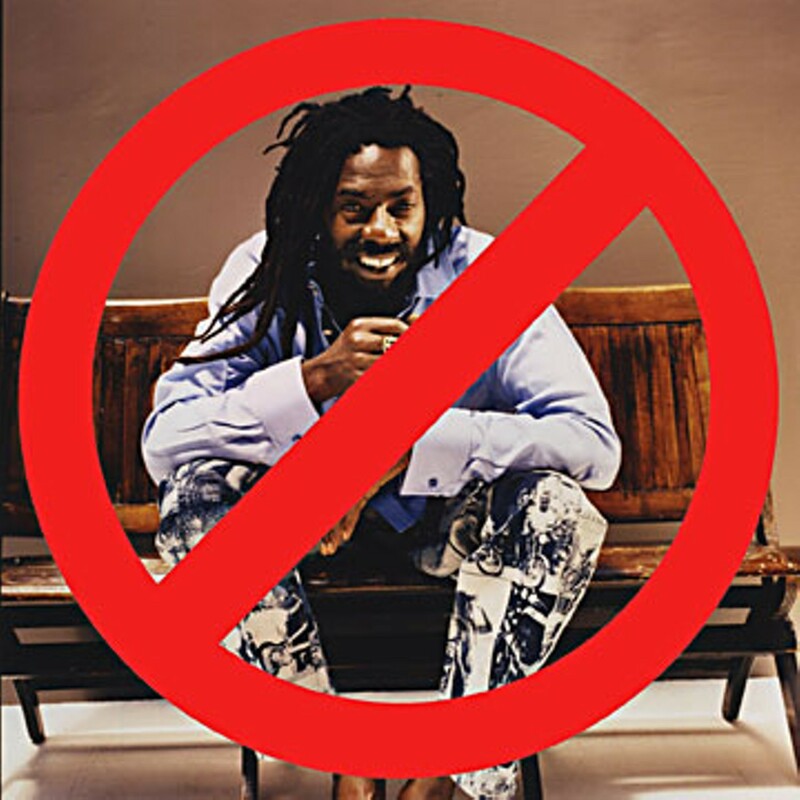 Defending Buju, Shabba suggested that crucifixion would be a fitting punishment for gays. The incident was widely publicized and effectively sidetracked Shabba's career. In the years that followed, British gay rights activist Peter Tatchell would coin the term "Murder Music" to describe violently homophobic work by a group of notorious Jamaican artists including Beenie Man, Sizzla, Capleton and Buju Banton. Working with the group OutRage!, Tatchell mounted a successful blacklist campaign that torpedoed tours and even blocked musicians from entering England and Canada. The anti-Murder Music campaign hit Humboldt in 2004 when a show by Capleton at Humboldt State was canceled in response to student complaints. There was organized opposition to a Buju appearance at the Mateel in 2006, but that time the show ultimately went on (and sold out). OutRage! declared a victory of sorts in June 2007, when, bowing to unrelenting pressure, Beenie Man, Capleton, Sizzla and Buju Banton all signed something called "the Reggae Compassionate Act," a pledge that said in part, "We agree to not make statements or perform songs that incite hatred or violence against anyone from any community." Signing was a calculated risk. The financial loss from being blacklisted was considerable, but many Jamaican fans, who live in a country described in a Time magazine story as "the most homophobic place on Earth," saw signing as a capitulation. Buju and Beenie both allegedly disavowed signing the statement and campaigns against their shows continue. Buju's fall 2009 tour saw concert giants AEG Live and Live Nation pull all of his shows from their venues. The viral battle in Humboldt, waged on Facebook and on blogs, was echoed across the country. Nevertheless, Buju's management declared the tour "a success" in a press release issued Monday, claiming, "Despite the ongoing smear campaign against Banton, promoters are already calling it the biggest selling reggae tour of the year." The release includes a message from Buju that tries to put "Boom Bye Bye" behind him: "I do not condone violence against anyone, including gays, and I have spent my career rallying against violence and injustice through music," he writes. "At this point, I can only hope that my body of work speaks for itself and that anyone still offended by the lyrics of my youth will take the time to explore my catalog or come to one of my shows before reducing my character and entire musical repertoire to a single song." It wasn't enough for Nocturnum's Gil Miracle. "We tried for a week to get a statement from them, and we finally got that from Buju, but it was too little, too late," said Miracle in a call on Monday. "This won't end until he comes forward and really denounces what he said. In the end, canceling the show was just the right thing to do." So much for what's not happening; let's move on to what is happening this weekend at Nocturnum. Saturday they have A Hawk and a Hacksaw, with music about as far from dancehall reggae as you can imagine. Based in Zuzax, N.M., AHAAH's core members -- violinist Heather Trost and percussionist Jeremy Barnes (who played drums in the Elephant 6 indie band, Neutral Milk Hotel) -- make music firmly rooted in Balkan folk traditions. Since their last couple of records were down with a Bulgarian band, Hun Hangár Ensemble, I'm not sure what they'll do on this tour, but I imagine it'll be very cool. They're traveling with Damon and Naomi, a dream-pop duo pairing Damon Krukowski and Naomi Yang, both former members of the ’80s indie trio Galaxie 500. You'll hear a bit of Balkan in the music of the local a capella group AkaBella, who celebrate the release of their first album, The Beltane Sessions, with a party next Saturday night, Oct. 17, at Redwood Raks. Of course, East-Euro is only one style they draw on in their haunting collection of songs from around the globe, threading together traditional African and Cuban vocal styles, Hebrew and gospel music, a touch of reggae, even trad Japanese. It's an impressive offering that demonstrates the universality of the human voice, the first instrument. Joining the party Saturday: the all-women West African drum troupe Guinea Gbe, songster (and "heart throb") Berel Alexander and DJ Knutz, who will provide "funky vintage grooves" for dancers. The neo-surf band Robbie Allen and The Outer Edge brings two nights of "acid surf rock" to Humboldt, playing Friday at Six Rivers Brewery and Saturday at the Wave at Blue Lake Casino. Allen was schooled by The Ventures (he plays guitars made by the legendary surf masters), but he also sites The Mermen as inspiration for his surf instrumentals. Humboldt Hoptoberfest is back, Saturday from noon until 6 p.m. in Blue Lake's Perigot Park. Of course they'll have beer (from at least nine North Coast breweries). Bands include DogBone, The Brendas, Good Company and Fear Mia, a folk/funk/bluegrass outfit from Los Angeles. All proceeds go to the Blue Lake Education Foundation, supporting music, sports and arts programs at the local school. Speaking of school benefits: Coastal Grove Charter School has its annual Medieval Festival of Courage Saturday and Sunday out by Mad River Hospital. You'll find the usual Renaissance Faire fare -- wandering minstrels, jousting knights, etc. but also some surprises: Joanne Rand plays Saturday (3:15 p.m.) as does Dead cover band The Miracle Show (5:45 p.m., early enough for their gig at the Red Fox later that night). Sunday's festivities end with a set by The Fickle Hillbillies, another less-than-medieval rock band. The Humboldt Council of the Blind benefit at the Alibi Saturday features punky Irish tunes by The Smashed Glass and tongue-in-cheek rock by Splinter Cell, whose bass player, Jimmy, is some sort of HCotB muck-de-muck (and a very cool guy). Sunday at the Mateel, Just ’Cause presents an evening of spacey electrodance music with remix masters The Glitch Mob, R/D, Danny Corn and Christopher Cadence with VJ Rhett Bice providing visuals. Last week we had a pair of String Cheesers who've moved on to new pursuits; Tuesday, Oct. 13, we get another: keyboardist Kyle Hollingsworth, touring behind a new disc, Then There's Now, mixing sometimes blippy synth jams with catchy pop vocal hooks. He's touring with multi-instrumentalist Zach Gil, central figure in the beach-rock groove band Animal Liberation Orchestra. Banjo wizard/slide guitar jammer Tony Furtado stops by the Arcata Playhouse Wednesday, Oct. 14, for an early show in support of his 14th album, Deep Water. He's on the road with Mia Dyson, a rootsy blues singer/songwriter from the land down under. Dyson, who reminds me of a young Bonnie Raitt, is a big deal back home, winner of an ARIA (the Aussie version of a Grammy) for best blues and roots album. Later on Wednesday, livetronic guitar-slinger/knob-turner J Wail and drummer aNdu return to Humboldt for a show at Humboldt Brews they're calling the Naughty Nature Harvest Ball, with "costumes consisting of purely nature" encouraged. Reba will let the music inspire a painting or two; DJ Touch gets things going with some natural grooves. Go natural!